2.0 (Hindi) advance booking report has started late across India. In many places it is started today only. Generally big films advances starts atleast 2-3 days prior to the release. Tamil and Telugu version advance booking already started few days back and reports are terrific. 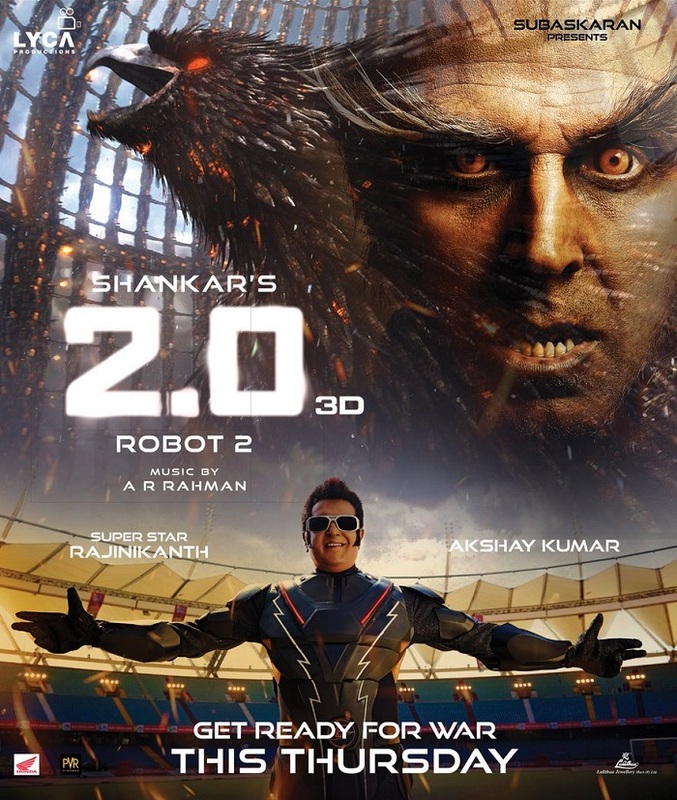 Now coming to 2.0 Hindi advance booking report for Thursday. Considering late start of advances and Thursday being a normal working day, advance booking is decent to good. Had advances been started earlier then definitely it would have helped the film cause further. Film has reported an advance booking of around 25-30% as per last report (Wednesday 6 pm). Advance booking of 3D format is better than 2D. Still, advances are going in brisk pace right now and there is still more than 12 hours left for the first show. There is no doubt further tickets will be sold out by the first show starts. Then there is spot booking which will boost the business further. Again, if reports of the film comes good, then we can expect jump in occupancy level on Friday, Saturday and Sunday. 2.0 will open big on Thursday. Going by the hype and build up anything less than 15-20 crore start will be a disappointment. Anything above 20 crore will be a good start. Anything above 25 crore nett will be a fantastic start to the campaign. With 1 releaseday left, 2point0 is struggling to draw advances for now. Akshay Kumar’s highest opening on non-holiday 15.24 cr [Housefull3]. Hope Rajni SIR's 2Point0 beats it. anil thadani and kjo are responsible for the this very late advance booking as they are having some sort of problems with film dustributers. Maine kal hi kaha tha distributer ne Big opening Ki hope khatam kar di h. Or big opening se hype banti h salon ne itni badi movie Ki maa bahen kar di. Agar Sunday ko booking khul jati to Aaj situation or hoti. Kyuki baar baar kon jayega theatre mein tickets lene. Log mall mein ghumte huye ticket le aate but booking hi nahi thi ab Jo Wednesday gya h wo ticket le aaya. Online bhi roj roj check karke log thak gye the. Permotion bhi us level ka nahi hua h now all depends on wom. Baki kuch logon ko pata hi nahi k movie kal release hogi. Mere dost soch rahe the Friday ko hogi maine unhe bataya kal h. Asiey hi lakh on milenge North mein. Akki Ki kismet hi kharab h.
Advance started very late. But hype is very high. Opening will be very good. Are ye Bahubali 2 ka record todeha ya nahi seedha point me aao. Positive reports out for the movie. People saying it's BB2. Blockbuster.